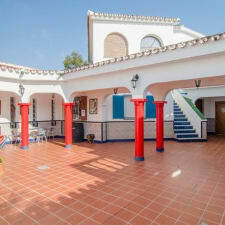 La Finca Buenavista is located in the small village of Chilches, under the municipality of Vélez Málaga. Located in a prime location, high on a hill in the centre of an ancient agricultural farm has 8 apartments and one independent rural house in the direct contact with nature. A place of rest and tranquility from which you can enjoy all the services and activities proposed by a region such as La Axarquia, in the heart of the Costa del Sol. Beach, sun, snow, mountain, water sports, golf, culture, gastronomy are some of the benefits you will have at your fingertips living in a rural setting, just fifteen minutes from Malaga and with the most enviable climate in Europe. La Finca Buenavista has a plot of 80,000 m2 of trees and scrub, which besides the house has a barbecue area, ample parking and a landscaped pool. The main building, "La Hacienda" is structured around a central courtyard that distributes accesses to different apartments. "La Hacienda" consists of 8 fully equipped units from 1 to 3 bedrooms that can accommodate from 1-7 per apartment. Apartments' guests. and their almost 40 beds can be accommodated for conventions, events, celebrations, etc.